Leopold Simmons with his Leghorn, Dove. Patsy, a Laced Polish hen, took home the award for Prettiest Plumage. 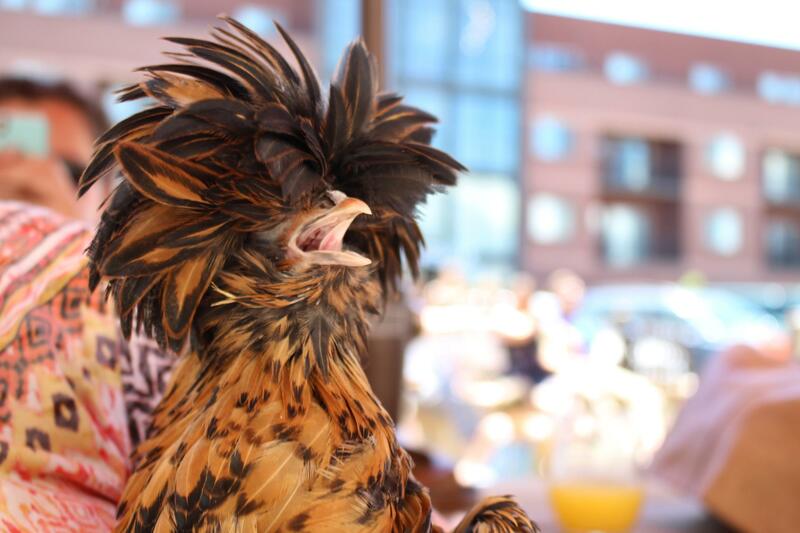 Her owner, Kristina Cash, says the hen's "Phyllis Diller hair" prevents her from seeing clearly, so she often runs into things. An Easter Egger named Agnes snagged the year's Best in Show award. 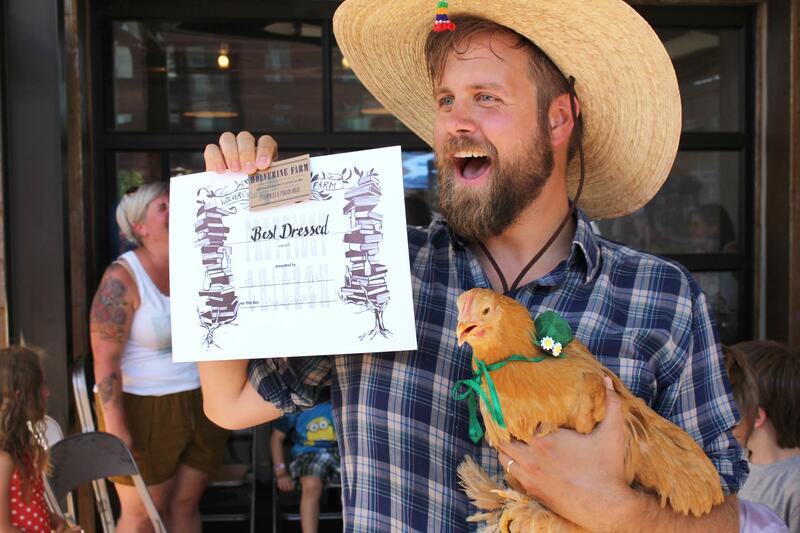 Cale Whicker, with Miss Felicia Fancy Feet, displays their award for the competition's best-dressed chicken. The favorite activity of this Polish Crested hen named Chicken is listed as "chasing chihuahuas." 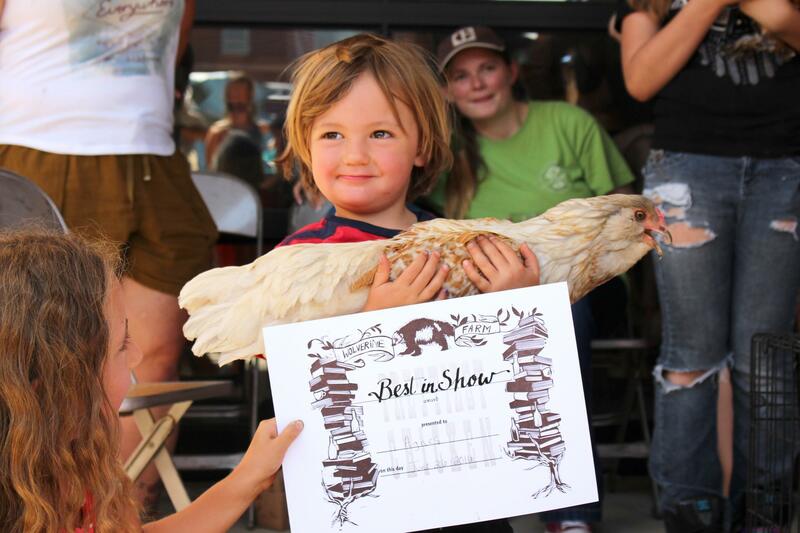 On a sweltering Sunday afternoon in Fort Collins, Colo., 16 of the region's finest hens and roosters competed for a chance to win Best in Show at the 2016 Prettiest Chicken Contest. The event took place at the Wolverine Farm Letterpress & Publick House — a publishing house, bar and print shop that hosts quirky community events. "You hear people talk about chickens just like they'd talk about any of their other pets," says Wolverine Farm's owner Todd Simmons. "They're excited about their different breeds and their different personalities." One Polish Crested hen named Chicken, for instance, listed her favorite activity as "chasing Chihuahuas." Her competitor, Jeff, a red-combed rooster with emerald plumage, informed judges that he prefers predawn crowing, naturally. White Leghorn, Dove, would use her fame and notoriety from the competition, quite appropriately, to work for world peace. "I think people have really been expanding their knowledge of the breeds they know — the Rhode Island Reds, the Leghorns, the Barred Rocks — and getting into some of the more exotic breeds," Simmons adds. 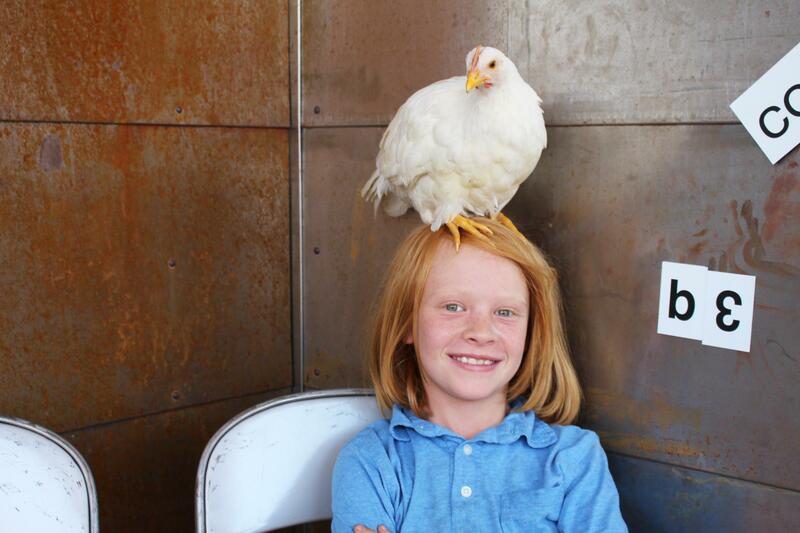 Patsy, who pecked her way to the top to win the award for Prettiest Plumage, is a Laced Polish hen. 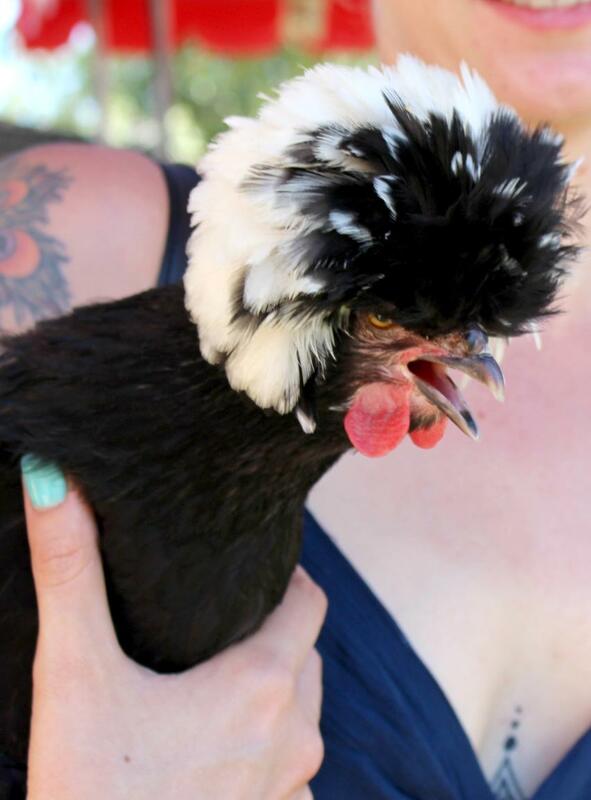 She's a unique breed, with what her owner Kristina Cash describes as "Phyllis Diller hair." Though that impossibly fashionable plumage, Cash says, prevents Patsy from seeing clearly, so she often runs into things. An Easter Egger named Agnes landed Best in Show. For consolation prizes, other chickens collected Loveliest Legs and Coolest Cluck. Miss Felicia Fancy Feet, of course, won Best Dressed. This year's contest was the inaugural event, but Simmons says the hope is to make it a recurring contest.